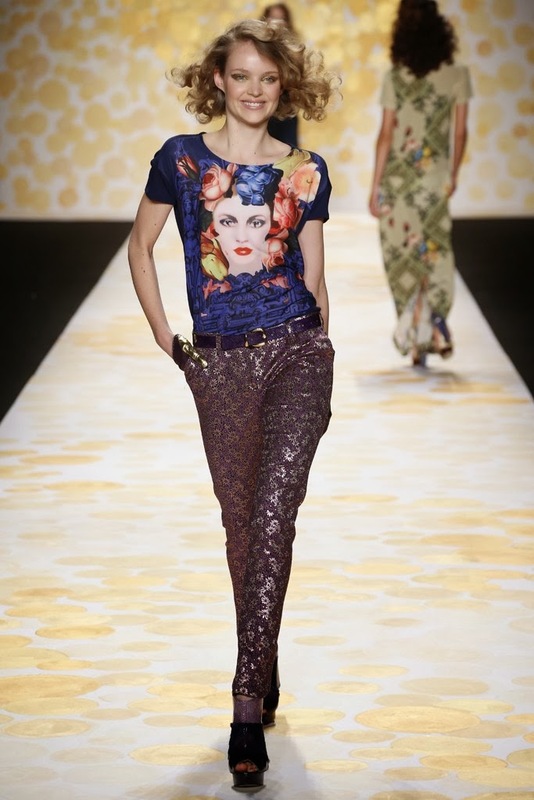 My first fashion show for the Fall/Winter 2014 season was Desigual's Fall/Winter 2014 collection. I am so happy that this show was my first for this season because it was so upbeat and happy. The heart heme for this season of Mercedes-Benz Fashion Week seemed to influence the theme and vibe of Desigual's show as the models were blowing kisses to the audience, dancing and even through out plush hearts at the end of the show while walking out arm and arm (it felt very "return of the 90's runway and supermodel")! It is thrilling to see designers deciding to have fun with their shows again. The Desigual show had me smiling the entire time with it's amazing energy and fabulous clothes! Let's take a look at some of my favorite looks from the runway. Another reason why I am super glad that the Desigual show was my first of the season was because I got to see my favorite Victoria's Secret Angel, Candice Swanepole, work the runway! I feel like everyone has their favorite angel and "Candy" is totally mine! She was the perfect model to open a show where love is the theme and the companies motto is when "la vida es chula, love is always in the air." I am also loving the pop art floral print on top of large polka dots. It feels very "spring for fall" which has been a huge trend the last few fall seasons. I was super into all of the huge polka dot prints and was obsessed with the black gloves with the golden thumbs! This is one of my fave looks from the collection. This outfit with the scarf, that hair and those open toed booties is just perfection! Jackets like this are why I tell people that they can look cute and warm at the same time. These alpaca coats have a fun 90's feel to them and would make a great going out coat. I love how this collection played with shapes, texture and patterns! The lining of this coat is gorgeous! 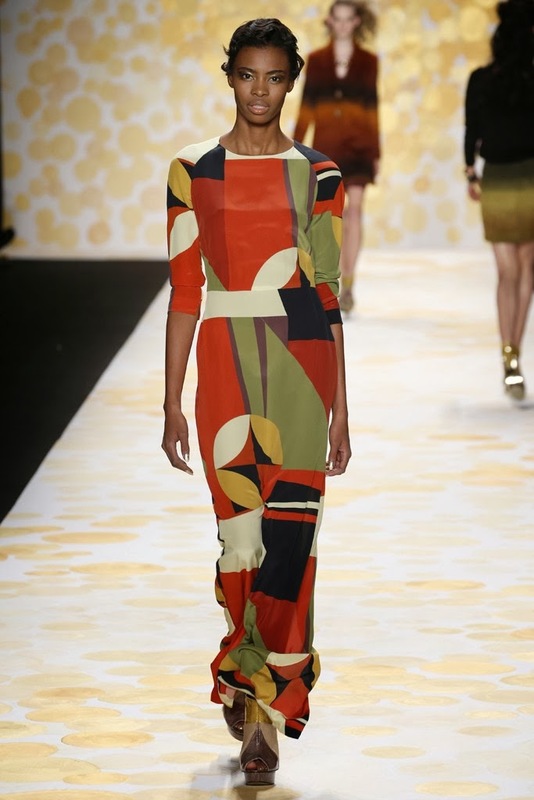 There is definitely 90's influences here with big bold geometric shapes and prints. I am obviously loving the orange. This jumpsuit is so good. Another return to some late 90's looks with metallic pants and skirts. I love a good overcoat! This one is gorgeous! This coat should be worn by a girl who loves making a statement and an entrance all at the same time. The girl who is noticed when she walks in even before she removes her coat is everything! Candy makes this golden look oh so hot! 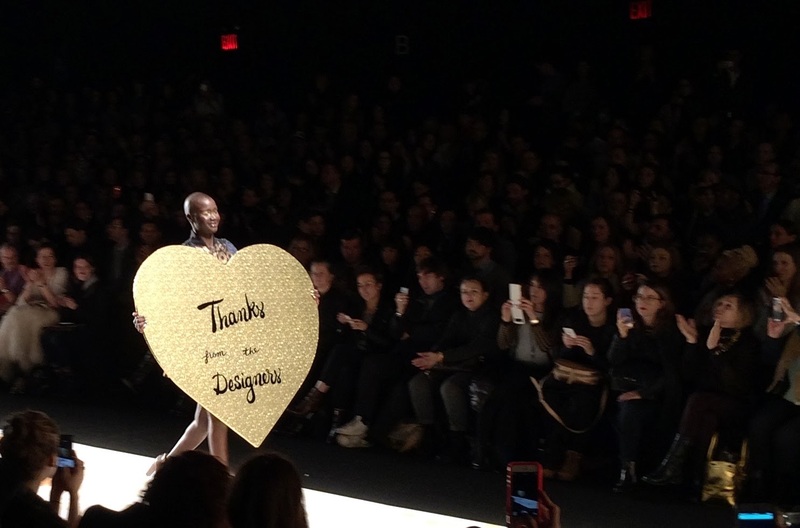 Love this pick of Ataui Deng dancing and displaying a golden heart with a special message from the Desigual designers. Such a fun show! 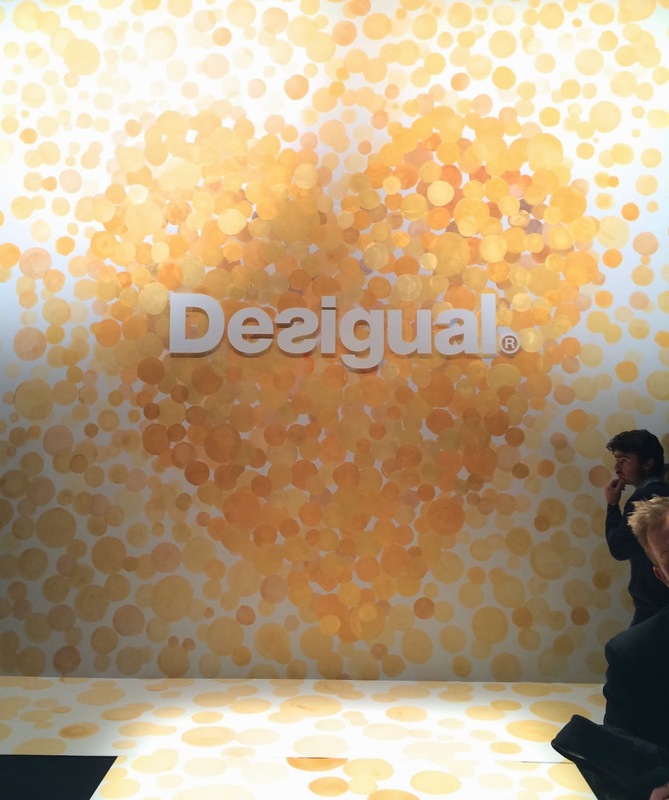 Thanks so much to Desigual for having OJ&B at their Fall/Winter 2014 show! Hope to see you again in September!